Prepare Meatballs: Preheat oven to 350º. Spray rimmed baking pan with nonstick cooking spray. In large bowl, gently mix all meatball ingredients. Form meat mixture into 1-inch balls and place on prepared pan. Bake meatballs 25 minutes or until browned and internal temperature reaches 165º. Meanwhile, prepare Tomato-Herb BBQ Sauce: In large skillet, heat oil over medium heat. Add garlic and onion, and cook 5 to 6 minutes or until onion is soft. Add tomatoes and barbeque sauce; simmer 5 minutes or until heated through. Stir in pepper. Additional barbeque sauce may be added, if desired. Place meatballs on serving plate. 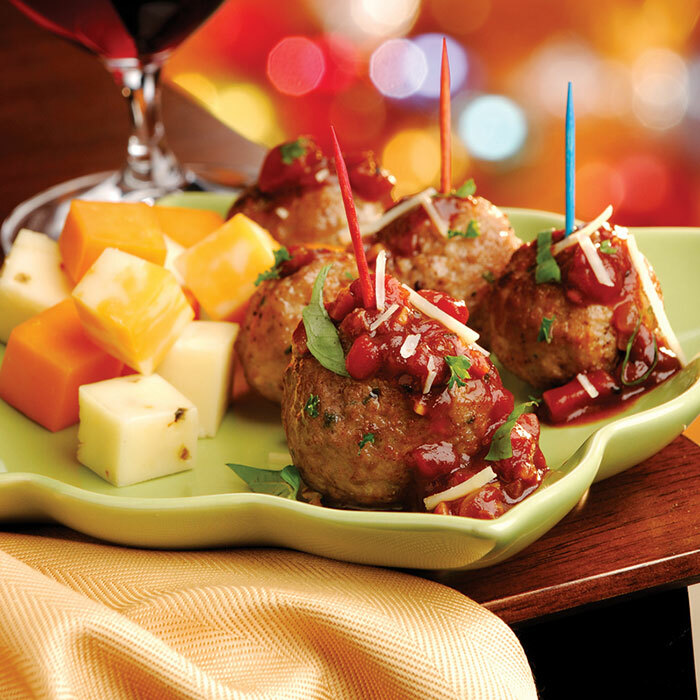 Top meatballs with Tomato-Herb BBQ Sauce, sprinkle with Parmesan and garnish with basil and parsley.